You talk to anybody who had visited Darjeeling and ask about great places in the hill town, the Chowrasta Mall will surely be one thing that will figure in the description. That's true. 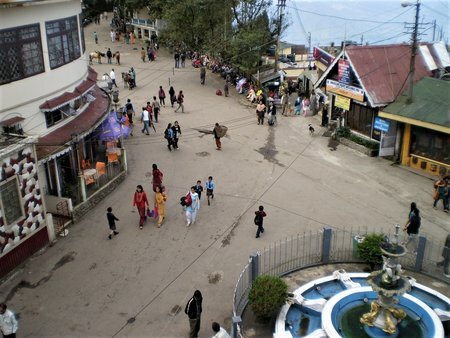 The Chowrasta or the Mall is the heart of Darjeeling town. Located on top of Nehru Road, this is a nice flat land where tourists and locals come to lounge in the sun, take a seat on one of the many benches along the periphery, and watch the wonderful views of the mountain peaks and valleys all around. Mall is like the town center or the social center of Darjeeling. This is where some of the old and heritage stores are lined up on one side, and there is open view on the other with many pine trees all around. If you want to feel the real vibe of Darjeeling, watch people and activities, this is the place to come. Another thing that you won't miss here... there are lots of young local lads with their ponies offering horse rides to children. Many elderly tourists indulge as well. 3) The famous Mall Road which originates from one side, goes around the Observatory Hill and comes back into the Mall from the other side. However there are few other narrow lanes that also originate or terminate at the Mall that are not counted as part of the four main roads. So when you look around the Mall what do you see? On one occasion, I stood at the middle of the mall and slowly turned my head to get a full 360 degree view. I'll start from the entrance to the Mall from the Nehru Road. Right after the entrance there is a small fountain that has models of golden colored fishes and pelicans with low iron fence around it. However I have seldom seen this fountain operational though. If you now slowly turn anti-clockwise towards left, you will see the building where the Bellevue Hotel is located overlooking the Mall. Further on the left you will see the Dr. Zakir Hussain Road entering the Mall through a crowded bazaar or market area. On that road you will get all sorts of grocery items, vegetables and fruits. Further left on the boundary of the Mall are a number of small shops selling items like tea, curios, art & craft, gifts and souvenir items. Next there is a narrow entrance to a budget hotel called Holiday Home with stairs going below. On its left is the Police Assistance Booth. 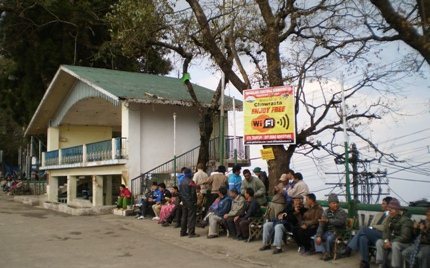 This booth is manned 24 hours by Darjeeling Police. They also keep filtered drinking water in a steel water filter can with a tap and is available to the public as well. So if you are thirsty and don't mind having police supplied filtered water, you can come here and have a glass of water. It's free. On the left of the police booth is the Coffee Cafe Day, a cafe having both large inside and outside terrace seating. On its left you will see benches laid out and people sitting there enjoying the Mall activities. There are local vendors who sell tea and other small snack items like alu dum (spiced boiled potato) that are favorites to many as they sit and enjoy the atmosphere. Further left on the boundary is the Hawa Ghar, a large two storied concrete structure where cultural programs like Nepali dance and music are performed during the high season. The upper floor is used for the program. The triangular shaped structure is like an elevated stage. Chairs area laid out in the mall and people watch the shows sitting or standing on the grounds of the Mall. The upper floor facing the Mall is used for the program, while the lower floor is used for preparations (more like a green room) and also as a kitchen to prepare food that are sold to the audience. 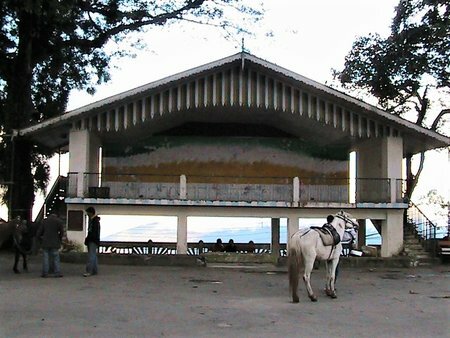 Hawa Ghar is also used at times to deliver political speeches to the people of Darjeeling by ministers and dignitaries. On the left of Hawa Ghar there are again benches laid out for people to sit under the pine trees and behind which is the grand view of the mountains. As you look further left in the Mall, you will see a section of the scenic Mall Road that goes out and makes a full circle around the well known Observatory Hill for about a mile and returns to the Mall about 100 yards left of its origin. 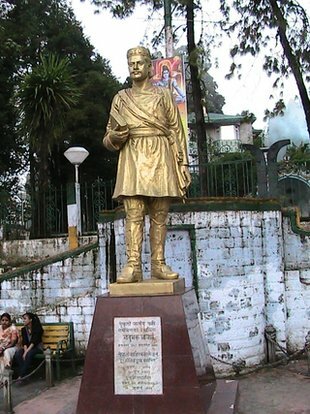 In between the two entrances of the Mall Road, there is a huge golden color statue of the Nepali poet Bhanubhakta Acharya. He wrote the Nepali version of Ramayana translating it from Sanskrit. He was born in 1814 and died in 1868. This statue was originally erected on June 17, 1949 and reinstalled on July 13, 1996 by the Nepali Sahitya Sammelan, a Nepali community. Just next to the statue and on its right there is a special seating with a shade and having a board saying "Senior Citizens Only". You will find several old people, mostly locals who are sitting here. Update 2014: The nice park behind the poet's statue has been converted into a large concrete stage area for holding functions. The senior citizen shed is also gone. The entire mall area is now a free wi-fi zone (implemented by GTA tourism). As you look towards left, you will now see a series of well known shops. First the outlet Tibet Art selling lots of artwork. There is a great attraction for both locals and tourists at a little corner here. Right next to the Tibet Art where a narrow lane goes below the Mall Road, you will see a Phuchka walas - men selling phuchkas (also known as pani puris or golgappas) from his small stand & basket. Phuchkas are street snacks that are small hollow flour balls having fillings made out of spiced potato and tamarind water. They sell like hot cakes in various parts of India and are favorites to both children and old. They also sells masala muri and bhel puri, two other types of snacks made of puffed rice and various kinds of spice and ingredients. Price is reasonable and comparable to that of Kolkata. 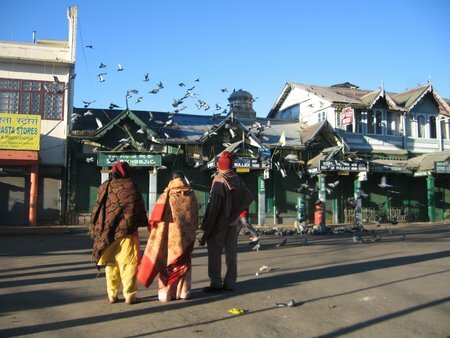 On the left of Tibet Art is Nathmulls Tea Store & Sunset Lounge where you can relish a cup of Darjeeling tea with cakes. Nathmull's is an old family run establishment in Darjeeling and offers some of the largest collections of Darjeeling Tea. Next to it is the shop Life & Leaf which sells organic tea & honey cultivated by local farmers, many small hand crafted items like mugs & tea sets etc. Adjacent to it is the well known tea lounge Golden Tips offering tea and snacks. On the left of Golden Tip is the famous Oxford Book & Stationery, an old and one of the best book stores in Darjeeling. On its left is another famous store that was established in 1890 and exist in two sections run by two brothers, the Habeeb Mullick & Son that has been selling rare collections of artwork, curios, special jewelry and other souvenir items. Then there is a liquor or wine shop, and finally the last one close to the entry at the Nehru Road is the cafe and restaurant called the Fiesta that has both inside dining and outside seating under umbrellas. The Mall offers a great opportunity of shopping. If you like to know about the shops here and their offerings, check out Shops in Darjeeling Mall. Well that was about how the Darjeeling Chowrasta Mall is and what it offers. There are couple of more things to add that characterize the Mall in its unique way. You will find lots and lots of pigeons on the Mall. I don't know where they come from, but they are there all around. They sometimes fly very low over your head and can be quite scary. As I mentioned earlier, there are plenty of local lads with their ponies and horses offering rides. A short ride up to the Ranga Manch Bhawan, an auditorium along the Mall road on the left costs about Rupees 100/- and a full round along the one mile Mall Road costs about Rupees 200/-. But there is a flip side to this option of entertainment. The Mall area is often made dirty and smelly by these ponies. And lots of stray dogs on the Mall sometimes add to the irritants. Probably the municipality will need to be more sensitive to this special area. The Chowrasta or the Mall in Darjeeling can be reached through different roads. The most popular is the Nehru Road that starts from Gandhi Road where the restaurant Keventer's is located. If you walk along Nehiru Road, it would be a little uphill walk through shops on both sides. It takes about 5-7 minutes by walk. Taxis are not allowed in the Mall area. Taxis can only come up to the stand near the junction of Nehru road and Gandhi road, or up to the Windamere hotel on the Mall road from where it would be a shorter and easier walk to the Mall. Check out Darjeeling Map to see the location of the place. Mall area always remains open and there is a police vigilance round the clock. However it is not advisable to hang around here late at night. All shops generally close by 8pm around the Mall. Thanks Raj, obviously I shall share my experience on my return. I already have maximum of my questions answered from your helpful site. Another query, if I opt to stay near Darjeeling railway station (Mahatab Chand Road) how long shall I have to walk to reach mall, what will be the shortest route. 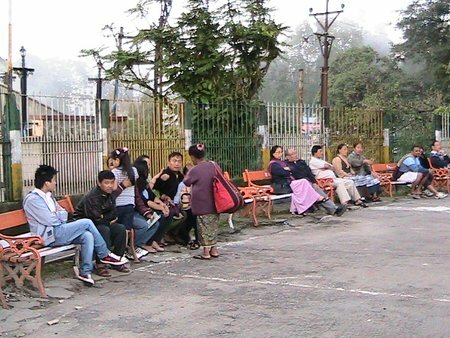 Hi, From Darjeeling Railway Station the Mall (Chowrasta) is about 1km and it's an uphill walk (will take about 35-40 minutes). From Hill Cart Road (at Darjeeling station) take Laden la Road and then Nehru Road to reach the mall.